Good afternoon and happy Thursday. I got a new set of stamps yesterday and they were so happy that I had to go and ink them up straight away. I started by brayering a massive tag with Fresco's. Then added some background stamping and some circles coloured with the same paints. These Zinski sheep are such fun - I love the one that's doing her knitting lol. Then just added the sentiment and we're all done. These sheep make me very happy! 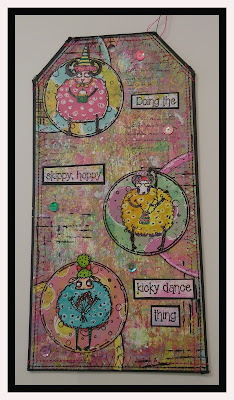 I'm entering them into the Simon Says Stamp Wednesday challenge, which is Bright and Cheerful, and the Craft Stamper TIMI June challenge which is Anything Goes. Ooh, I ordered those this morning... they're so much fun! You've done a great job with them. Lovely inspiration. Thanks. Another FANTATSIC tag ! ADORABLE and great to see your progress! It's a good feeling to receive new crafty goodies and even better when you get to use them straight away. So much fun from this fab trio... I like the knitting one too. Another fab tag Sue, Thank you for sharing. I so miss making tags!!! You have inspired me to find the massive quantity I have and get crafty with them! Love you new stamp and have you have used it multiple times in the same project. Sweet background, too! Wonderful tag Sue! The images are super cute and I love the background you've created.